27 Orchid Avenue, Surfers Paradise, Queensland. 4217 Australia. St. Tropez Resort offers Mediterranean-style, self-contained apartments perfect for an action packed getaway of sun, surf and night life in the heart of Surfers Paradise. St Tropez offers a choice of spacious self-contained apartments - available in one and two bedroom apartments, all with an outdoor balcony or courtyard. All with fully equipped kitchens, there is an apartment style to suit both couples and families of all ages. If you're looking to be close to the "surf and sand" of one of the most famous beaches in the world, stay at St Tropez, which is 2 minutes from the sea. If you're looking to experience the social life, the resort is conveniently located on one of the most popular streets in Surfers Paradise for fashion and nightlife. 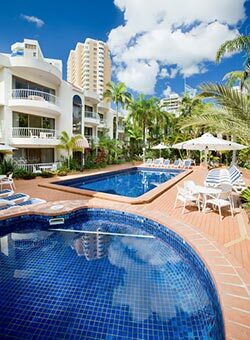 St Tropez Resort is located in the heart of vibrant Surfers Paradise. St Tropez offers self contained one and two bedroom apartments right in the heart of Surfers Paradise. Available with 1 Queen bed. Available with 1 Queen + 2 single beds. Features ensuite in master bedroom. Buses will pick you up and deliver you to airports, theme parks and other tour destinations. Tickets to all the major tourist attractions can be purchased from our office (often at discounted prices).